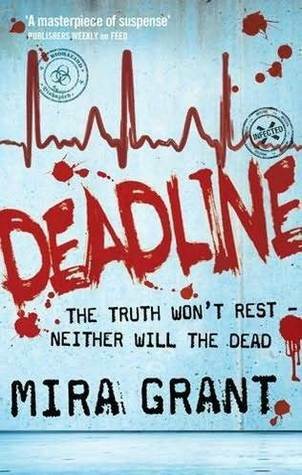 ‘Deadline’ is the second book in the Newsflesh series by Mira Grant, continuing on the conspiracy that Shaun and George set out to uncover. One year has passed, and Shaun isn’t too well for reasons I won’t go into, in case you’re yet to read Feed. Yet despite everything that’s recently happened to him, and what’s going on in his mind currently, not even Shaun can turn away when a CDC (Centre of Disease Control) researcher turns up at his door… because everyone had thought she died. Turns out she only faked her death, and with a horde of zombies following her he can’t exactly close the door on her now, can he? While the first book was told primarily through George’s point of view, this book now takes place via Shaun’s, and we discover more through this, now we’re able to know his thoughts as well. The action feels though it happens faster, possibly because of how he thinks and plans their course of attack as it were. This novel is heavily plot driven which makes for a short review, for there’s less to say without giving spoilers away. The majority of reading reactions involved a lot of caps and spamming keyboards, even for the more eloquent and those less-likely to respond in such a way, simply because it’s hard to recount exactly what happens whilst summing up our feelings on it. It’s all very big and grand, Grant daring to do what few others would to their characters. Overall, what is always so reliable in Grant’s novels is the way she deals with science, making it all seem so very accurate. As noted in her acknowledgments she does her research, and she is also able to explain and weave it in without making it too hard to understand, or an ‘info-dump’. Some of the characters are probably my only nitpick, if I were to search for one. While she excels at including the usually looked-over personality-type, and while her main characters are always strong and interesting, sometimes her background characters are otherwise lacking, serving only as stereotypical plot points for angst or trouble. Come may need another element to make them feel more real or if they need more whispers throughout previous chapters to make their actions more believable. This is one of the few series where the second book doesn’t feel or read like filler or a middle book. This is every bit as vital as the first and the last, and was simply so enjoying to read.